HVAC books, manuals and guides. Air conditioning, heat pump, boiler, furnace, indoor air quality, geothermal, solar and other alternative HVAC energy books and software programs. Flat rate pricing, estimating, preventive maintenance, asset, price, energy and inventory management software. Guides and software for the HVAC and service industry. It only makes sense to adapt your service company to use computers both in the office and in the field. HVACASAP.com's mission is to offer the most extensive online direct-link search site for the HVAC and service industry. energy management software:Computer software that monitors and records energy usage in different applications. In the HVAC industry, an energy management system monitors and controls temperatures, efficiency, air quality, fuel and electrical consumption, and zoning in heating and air conditioning systems. estimating software:Also called Project Management Software, these computer programs are designed for calculating construction costs. This includes materials, tools, labor, travel, overhead costs, and profit. Some programs provide detailed calculations for accurate project scopes. Bidding software uses industry rates and take-offs for quicker estimates. flat rate pricing software:Software used for determining a set price for labor or materials that includes a ratio of different billing factors already built-in. Flat rate prices can be used in estimating, bidding and invoicing. In the service industry, flat rate prices are used by field technicians to give the customer a set price to repair or replace parts or equipment. This pricing method gives a single, direct price instead of calculating all the factors that go into repairing or replacing a component or system. fleet management software:Computer software designed for controlling vehicle costs. Used in calculating fuel, mileage, insurance, overhead, and maintenance costs. Some programs calculate travel mileage for tax purposes and vehicle maintenance scheduling. Some programs include GPS tracking, dispatch scheduling, and inventory management. hvac design software:Engineering computer programs used to calculate and design the layout of heating, ventilation, and air conditioning systems for bidding, cost estimating, building codes, industry standards, and construction purposes. There is also HVAC design programs for duct and pipe layout and calculations. inventory management software:Computer software designed for controlling and tracking the quantity and flow of goods received, used in production, and sold. Used to effectively process and report on the constant flow and costs associated with materials and supplies being ordered and sold within a company. In the service industry this can be used to track and report on the tools and parts that are stocked on a vehicle. preventive maintenance software:Also termed Preventative Maintenance, this is a computer program designed to schedule and report costs associated with the maintenance of equipment used within a company. By being proactive in maintaining certain equipment, this reduces the expenditures in future repairs, premature failure, replacement, and operating costs. In the HVAC industry, maintenance is key in keeping systems running at optimal efficiency and life expectancy. For residential and commercial HVAC systems, a good preventive maintenance program will conserve energy consumption, manage repair costs, and control indoor air quality. price management software:A computer program that values a product or service using the different factors of market conditions, competition, margins, and input costs. Most software calculates and produces a pricing analysis and optimization reports. A good pricing strategy will provide the figures needed to be competitive while maintaining the profit margins and overhead costs associated with that product or service. service management software:Also termed Field Management, this software manages dispatching, scheduling, work orders, and invoicing for personnel who work outside of a company. A good service management plan can eliminate down times between service calls and can analyze costs and productivity of field personnel. evaporator coil:Also referred to as the indoor coil or air handler, this metal finned component in the air conditioning cycle, is where liquid refrigerant changes to a vapor. This process absorbs heat in the air that passes through it leaving cooler air to exit the coil. pressure relief valve:Safety device that relieves excess pressure in a hydronic (water or steam boiler) system. Also termed as a blow-off, each valve is engineered to release at certain temperatures and pressures. Warning: NEVER plug or seal off a relief valve with anything, not even a rag or towel! A leaking valve is a sign there is a problem with the system. The water or steam in a boiler system is very hot and can cause scalding if improperly serviced! NEVER replace a valve without knowing the proper temperature and pressure limits of the system! enthalpy control:A commercial HVAC control that compares the enthalpy (sensible heat, latent heat and relative humidity) of the return air with the enthalpy of the outside air. Theses controls automatically adjust the economizer's dampers to bring in a percentage of outside air or restrict it from entering the system depending on certain conditions. Tech Note: To understand "enthalpy", a HVAC technician needs to be able to calculate the sensible and latent heat and humidity in the air. This means determining the dry bulb temperature, wet bulb temperature, and relative humidity of the air and comparing this information to a psychrometrics chart. duct damper:Located in the supply duct, this adjustable plate is used to restrict or regulate airflow. Manual dampers are used to balance airflow so that a branch (lateral) in the ductwork is regulated by turning the outer handle and locking it in the desired position. In ductwork running horizontally, a fully open damper will point in the direction (length) of the duct ↔. A closed damper will point to the depth of the duct ↕. Dampers can also be mechanically controlled to allow air to certain areas when a control opens or closes it automatically. roll-out switch:Also called a flame roll out or roll-out limit, this safety device breaks a low-voltage circuit when it exceeds cut-out temperatures. Most have a manual reset button, but different furnace models have different cut-out limits. The limit will trip if over-heating occurs in a gas-fired furnace and is mounted near the burners. Tech Note: Like most switches that can be reset, we recommend only resetting it ONE time, and if it trips again there is a problem. Roll-out switches only trip if there are high temperatures coming from the heat exchanger. This can be caused by an array of problems with the primary and secondary exchangers as with the venting of the system. One thing that can be visually checked is where the condensing flue is piped outside. Make sure both the exhaust and intake pipes are completely free of obstructions like snow, bushes, etc. coefficient of performance (COP):In terms relating to a geothermal heat pump system, this measurement of efficiency depicts the energy produced to the amount of electricity it took to supply that energy. The work to produce a unit of heat is measured against the electricity used to perform that work. A simplified equation would be for every 1 kilowatt (KW) of electricity = 1000 Watts = 3413 BTU/h (measurement of heat). As an example: If a geothermal heat pump delivers 48000 BTU/h, and it takes 5 KW of electricity to supply that heat: COP = 48000 / (3413 x 5) or 2.81. This is an example only, and is not based on any typical statistics. The higher the COP ratio the more efficient the heat pump system. ladder diagram:Also termed logic diagram, this type of electrical schematic shows the parallel interconnection of wiring in control circuits. Called a ladder diagram because the vertical lines (rails) shows the power supply and the connecting control circuits being drawn horizontally (rungs). metering device:Also called an accurator or thermostatic expansion valve (TXV), this device controls and reduces the refrigerant pressures in an air conditioning or heat pump system. It changes the refrigerant from a liquid to a vapor. The metering device is located at the evaporator (indoor) coil in an air conditioning system. In a heat pump system, there is a metering device at both the indoor coil and outdoor condensing coil. air exchange rate:Also called Air Changes per Hour (AC/hr), in IAQ terms this depicts the volume of air that enters and is removed from a space that is being conditioned in one hour. A standard air exchange calculation measures the CFMs (Cubic Feet per Minute) of air entering a space times 60 to equal Cubic Feet per Hour (CFH). This number is divided by the total Space Volume in cubic feet. To calculate total Space Volume (SV) in cubic feet, take the measurements; in feet, of the Length multiplied by the Width multiplied by the Height of the space being conditioned (SV = L' x W' x H'). Air Exchange Rate Formula: AC/hr = CFH / SV. angle of incidence:In solar energy terms, this is the angle of the sun's rays when directly lined with a solar collector's surface. A collector directly facing the sun has an angle of incidence of zero. As the sun rises on a fixed solar collector, if you drew a straight line from the horizon to the panel (azimuth) the angle would begin at negative 90 degrees (-90°). Depending on the angle of the collector, also termed "Collector Slope", the angle of incidence would increase until it was directly in-line with the panel (0°). As the sun continues to pass over the collector, the angle of incidence would again increase until it reaches 90° (zenith). The angle of incidence is based on the solar collector's initial and ending position with the sun. Some panels are in a fixed position, and others track the sun's path. Most HVAC business software can be tailored to any service business. 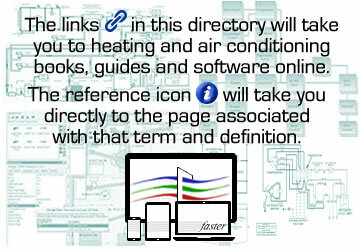 This directory contains an index that will guide you to specific HVAC books and software online. This directory focuses on books, guides, manuals and software programs pertaining to the HVAC and service industry. If you can not find the information you are looking for in this HVAC software and book online directory and its affiliated web pages, please contact us.